The island of Vvardenfell provides many examples on how creatures and their environments interact with each other. The Ash Blight wiped out Cliff Striders, Nix-Oxen, and Vvardvarks from Vvardenfell by the late Third Era. The Ghostfence was created with the intended purpose of stopping the spread of the blight, but was undermined in several ways. One notable way the blight spread out of containment on Red Mountain was the cliff racers living around the mountain; the cliff racer's ability to fly made the Ghostfence an almost laughable measure of containment as they could fly above the gate at will, which helped spread the blight throughout the island. This is not the extent of the cliff racer's effects on Vvardenfell; it was first an invasive species. It migrated into Vvardenfell from parts unknown and attacked and slowly overwhelmed the native dragon population. Eventually the dragons were fully driven out of Vvardenfell and their home there, Red Mountain. 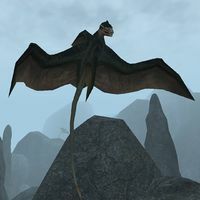 The cliff racers remained a dangerous threat to anyone who would travel to the already dangerous mountain until they were rumored to be driven out of Vvardenfell by Saint Jiub. 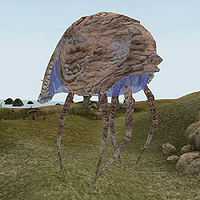 The creatures known as Silt Striders were once used in great number by the Dunmer as transportation, but the Red Year caused their numbers to dwindle as the eruption of Red Mountain killed most of them and destroyed their native habitat.